… But one of them will form the next government. The so-called silly season is upon us. Once more Barbadians will elect a new BLP/DLP government. Or a new DLP/BLP government. It’s six of one and half dozen of the other. (a) Radical reform of the educational system and the abolishment of the elitist Eleven Plus Exam, which continues to condemn our children to the equivalent of social and economic gas chambers. (b) Neither will contain the slightest reference to genuine worker/employee participation in company profits. We have mega businesses that either giving the workers peanuts or nothing at all in terms of real ownership. (c) Neither will touch land reform that will guarantee perpetual state ownership by the citizens of Barbados. The BLP/DLP has sold our prime land to the highest bidders. On the other hand a few rich locals control most if not all arable land. We can expect more of the same from the BLP/DLP collective. Mottley has been made to eat humble pie because she so badly wants to be Prime Minister. She has yet to demand that Arthur says publicly exactly, why in his opinion, some citizens may find her “unacceptable” as our Prime Minister. 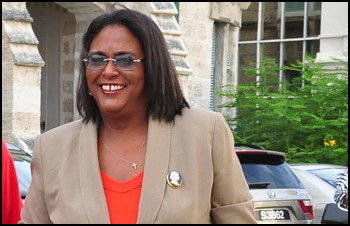 We are forced to ask: Is Mottley a threat to national security?